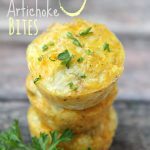 A cheesy quiche-like artichoke tart perfect for an appetizer table or special brunch. Set aside 1/3 cup of the artichoke marinade and drain the rest of the liquid from the jar. Chop the artichokes into small pieces; set aside. In a small saucepan over medium heat, combine the reserved marinade with the onion and the garlic. Cook for about 5 minutes or until the onion is cooked through and the liquid is absorbed. In a separate bowl, beat the eggs; stir in the onion mixture, bread crumbs, oregano, salt and pepper. Stir in the cheddar cheese and the artichoke pieces. Spoon the mixture into well-greased mini muffin pans. Bake for 18-20 minutes or until the egg is set. Allow to cool on a wire rack before removing bites from the pans. If you’re making the bites ahead of time, refrigerate until ready to serve. Pop the bites in the microwave just until warm before serving.